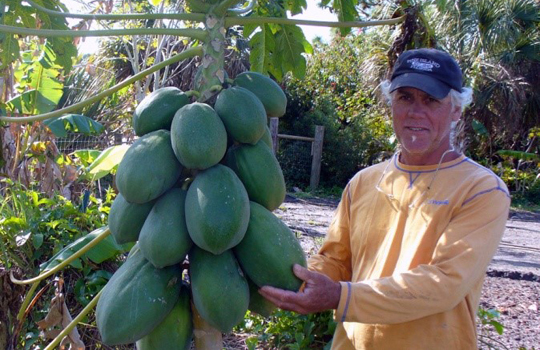 How Do Tropical Fruit Fertilizers Work? Tropical fruit is a mainstay of the modern human diet. Unfortunately, production of tropical fruit is impacted by repeated planting and harvesting of the product because that activity depletes soil of nutrients essential to optimum fruit production. Tropical fruit fertilizers reintroduce these nutrients to soil, promoting growth and assuring continued availability of this popular staple to the world. To continually reproduce beautiful, juicy, sweet fruit crops, growers need a product that is readily obtainable, easy to apply and that works. Fertilizers fill that need. Today’s fertilizers are formulated for specific application, according to type of fruit being raised, climate and soils available. They provide growers that necessary edge to produce tropical fruit that is colorful, sweet and nutritious, all necessary elements for commanding top market prices. The key disadvantage of adding fertilizers to soil is the uncertainty of application and the inherent biological and health risks associated with its use. Under used, they fail to provide adequate nutrients to the soil, resulting in sickly, diseased and nonproductive plants. The axiom “more is better” isn’t true with fertilizers. Overuse, in fact can be disastrous to the soil and the plants. When overused, the chemicals in fertilizers can get into water supplies, rivers and streams through runoff during rain. Repeated exposure to chemicals in fertilizers can be harmful to humans. Overuse also translates to waste, meaning decreased profits for the growers. Fertilizer boosters act as a cheering squad for tropical fruit plants. They do this is by helping the plant to more efficiently take up available nutrients and moisture from the soil. By helping enlarge the roots and strengthening the stalks, plants are better able to take advantage of the presence of the fertilizers and to capitalize on moisture surrounding them, resulting in a more effective utilization of plant nutrition. BioWash is made of processed extracts from natural plant oils. It contains very tiny particles called “colloidal micelles”. Each micelle carries a negative electro-magnetic charge that is capable of attracting, holding and exchanging positively charged particles (Cations) of magnesium, calcium, carbon, trace minerals and other nutrients in a manner that allows roots to more easily absorb them. This process, called Cationic Exchange, promotes easier absorption of nutrients and moisture by the plant. Through this process BioWash has been found to increase BRIX (sugar content) in the plant, making them more disease resistant. BioWash has also been shown to moderate cold and frost in tropical fruit groves down to 27 degrees. Because it’s extremely inexpensive to apply, BioWash actually saves the grower money by the reduced need for fertilizer. Faster growing, quicker maturing, healthier and better tasting fruit translates to higher yields and higher profits for the growers. That’s a sweet deal!